Amid the constant hum of washers and dryers at a Laundromat, Darla Crist penned the lines of haiku running through her head. Crist, the Writing Center coordinator at Indiana State University, wrote her first book "The God of Small Losses" in the spring of 2009, and it was accepted for publication by Finishing Line Press that summer. The book is available for advance orders now and should be out by the end of April. The book contains about 130 original haiku poems by Crist. Crist will read some of those lines during an evening of "Experience Japanese Culture" on April 15 at Indiana State University's Cunningham Library. "I'm surprised it's haiku but I'm glad it is," said Crist, whose fiction and poetry have appeared in journals. She does not consider herself a haiku poet, but "its brevity and its demand" appealed to her. Haiku is a type of Japanese poetry, with five syllables in the first line, seven in the second and five in the third line. Crist's book combines this Japanese poetry style with Midwestern themes. "I'm pleased with the way it came together with the themes," Crist said. Crist, also an adjunct faculty member in the English department, divided her time at the Laundromat between grading papers and writing haiku. She kept a notebook with her to write down the lines as they came to her, most often in the form of images. "Haiku is very imagistic, related to images," Crist said. "I would get an image in mind of emotion and then figure out how to hone it down to three lines." Though some of the lines in the book are based on moments with her family, Crist said the book is based more around the idea of characters, and she is baffled by some. "There is a widow and a widower in the piece. That is outside my realm of experience," she said. Nevertheless, those images and lines kept coming to her, so she wrote them down. I kept thinking in snapshots, those little moments and trying to hold onto them so I could write them down," she said. Crist also used lines from her master's thesis, a work of free verse poetry. She hopes this book of haiku will allow her to reach a wider audience than her previous works, which were published in journals. Crist's book will be a part of the "New Women's Voices Series" by Finishing Line Press. It is a series designed to give new female writers a chance to publish their work. "It's been cool," Crist said of her experience, though getting the manuscript to the publisher is "half the fun." The other half is waiting for the book to be printed. 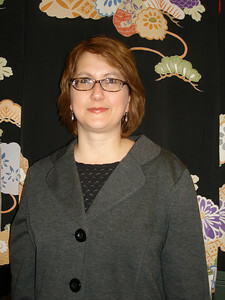 Crist will be reading some of her haiku at the Cunningham Memorial Library's "Experience Japanese Culture" event April 15 for National Library Week. The event will begin at 6 p.m. in the Library Events Area and will feature a variety of stations designed to give people a taste of Japanese culture through origami folding, a tea ceremony, sumi-e painting and more. The public is invited to attend this free event. Darla Crist will read her poetry during an evening of â€œExperience Japanese Cultureâ€ on April 15 at Indiana State Universityâ€™s Cunningham Library.